In 2004, we completed a full rehabilitation of our office. It is a top-of-the-line facility. In its design, patient treatment and comfort were our top concerns. The office space is laid out to maximize our providers’ efficiency and treatment quality. Operatories are equipped with ergonomic patient chairs and office décor was chosen to influence a calm feeling. Our team and our patients are enjoying the benefits of the new appearance and structure, and we continue to search for and add elements to enhance the quality and ease of patient visits. At NDA, we are dedicated to providing our patients with the best technology has to offer. Unlike some offices, we do not buy into fads, but instead research, pursue and implement high-quality technology that will help improve our patients’ care. NDA has computers in each operatory connected on a secure network. We have both intraoral cameras and professional quality photography equipment available to our doctors. As of January 2007, NDA keeps all patient records in a digital system. 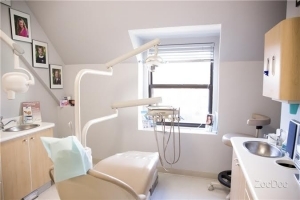 NDA is easily accessible and accommodating for patients with a variety of needs. Our building is equipped with an elevator. Our patient restroom was designed for use of patients with physical challenges and is large enough for a wheelchair and a nursing assistant for patients who have them. If you have any special needs that we should be prepared to address, please inform our front office staff before your appointment, so that we can make appropriate accommodations.